Find the difference. Find the difference. Any would do.. Wallpaper and background images in the Atheism club tagged: atheist god christianity religion difference jesus. and since you are an atheist, you WOULD know ALL about that. Wouldnt you? I'm whith thetacoman i'm a cathoilc and i think you preety racist for putting this here. Atheists are rich? Damn, I must be doing it wrong. Seriously guys, debate is welcome. Feel free to intelligently explain why you believe that this image is racist, and I'm sure we would all be more than willing to discuss it with you. The guy on the right is better looking. kingofrandom We're talking about religion here, not race. 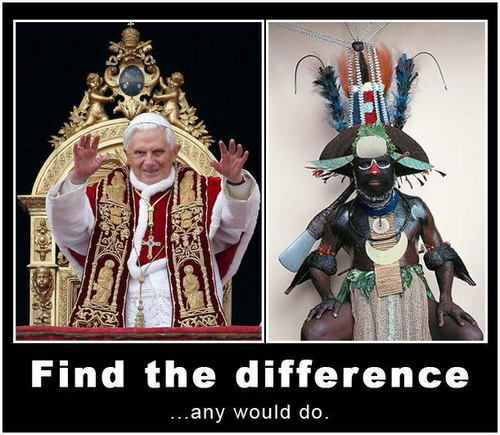 ^And besides, how is putting an image of Pope next to an image of African shaman racism? There was not said any of them is better than other. The religious rituals being basically the same is the whole point here. ^Exactly. I don't think that person realized what the point of the picture is.